Though it may seem hard to believe, the first flowers of spring will soon be upon us. It doesn't take a horticultural aficionado to appreciate these brightly colored petaled reproductive organs of angiosperms. The yellows, whites, blues, reds, and purples are a welcomed site after a gray cold winter. But, the emergence of certain plant species floral displays can be the warning signs for the appearance of diabolical plant damaging pests. The study of periodic plant and animal life cycle events and how these are influenced by seasonal and interannual variations in climate, as well as habitat factors (such as elevation) is called phenology. 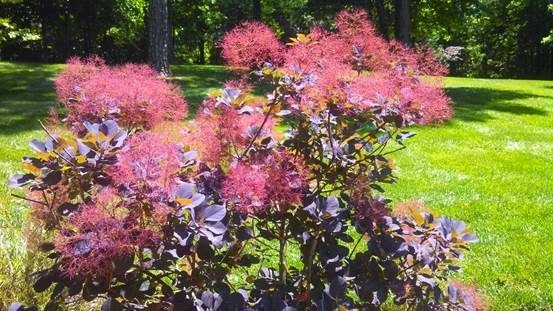 Smoke bush flowers coincide with Japanese maple scale crawlers. Monitoring the life cycle of plants (leaf expansion, flowering, color change, etc.) has been used for centuries in agriculture to determine the appropriate timing of when certain crops should be sown. In fact, the first record of phenology dates back to 974 BC *. Complementing phenology are growing degree days (GDD). GDD are calculated by taking the average of the daily maximum and minimum temperatures compared to a base temperature (usually 50°F). GDD are a measure of heat accumulation used to predict plant and arthropod development rates, such as, when flowers of a particular species may bloom, or when a particular insect will become active. Growing degree day charts highlighting common tree/shrub pests have been developed by the Ohio State University and Cornell University to name a few. The use of phenology and GDD is an important monitoring tool for integrated pest management practices in the landscape. The activity of many plant damaging pests coordinates to either the flowering or leaf expansion of common shrubs and trees, some of which may be in your backyard. When the hanging white racemes of black locust flowers appear (500 GDD +/-), the invasive emerald ash borer adults are beginning to emerge. The first flight of the adult dogwood borer corresponds to about 2 weeks after peak dogwood bloom (850 GDD +/-). Eight weeks after the full leaf expansion of red maple (1000 GDD +/-) the most vulnerable stage of gloomy scale appears. These are just a few examples of using phenological indicators to predict the emergence of tree damaging arthropod pests. Being in tune with phenology and growing degree days can be invaluable when developing a plant health care plan for our landscapes. Knowing when insect pests are active allows arborists to make precise treatments, which limit the amount of products applied in landscapes. This also reduces the chances of harming beneficial, or benign, critters that make our plants their home. Happy hunting!